Agility ladders are a great tool to use to increase your speed and quickness. Checkout this guide about agility ladders and how they can help you. The best agility ladder can get you moving quickly to increase your speed, balance, and coordination. The versatile piece of exercise equipment can help you learn to move in a variety of new ways, which can also target muscle groups you don’t typically target. Our guide can help you determine what agility ladder might be best suited to your workouts. What is an Agility Ladder For? Agility ladders are relatively inexpensive pieces of equipment that, interestingly, can give you some of the most versatility in your workouts. Agility ladders lay on the floor or ground, rather than a typical ladder that stands vertically. Using your legs and feet, you move through the rungs of the ladder in different directions and speeds using various movements to increase your agility. What Benefits Can an Agility Ladder Provide? Agility ladders are especially helpful for improving the muscles in your legs and feet since you’ll use them repeatedly with agility ladder exercises. Additionally, this type of equipment can help you target underutilized joints, ligaments, and muscle groups that you don’t typically target in other exercises. More importantly, perhaps, is what an agility ladder can provide to an overall cardio workout. Cardio workouts are heart-healthy because they can regulate blood pressure, increase blood circulation, and help get the heart pumping at healthy levels (1). Agility ladders provide similar benefits of other cardio workouts in that they get your blood moving and heart pumping to benefit your heart, burn calories, and increase oxygen to your muscles. Who Can Benefit from Agility Ladder Training? Anyone – even non-athletes – can use an agility ladder as an aid to their workouts. The great thing about an agility ladder is that you can complete beginner to advanced exercises with them and gradually increase your speed and intensity as you see fit. Agility ladders might also provide some additional fun for people who get bored with one type of workout. Those who play sports tend to use this piece of equipment frequently. Soccer and football players, for example, may benefit from enhancing their quick foot placement skills using an agility ladder. What Exercises Can I Do with an Agility Ladder? Stand in one of the two end squares of your ladder with your feet about a hip-width apart. Bend at your waist and knees so that your chest falls over your toes, also keeping your elbows bent at a 90-degree angle. Lean on the opposite leg of the one you’ll be moving first, then place the moving leg into the next square. Your weight should then shift to that leg. Bring your other leg to the same square and, at the same time, move your opposite leg to the next square. You should maintain an almost fluid movement of shifting your body weight and moving your legs into the squares. Continue moving down the ladder. Once you reach the end, complete the same movements in the opposite direction until you’ve finished several repetitions as fast as you can. You may have to start slowly with this exercise until you get a feel for the proper motion. Once you have your form down, you can begin to increase speed as you complete repetitions. Our top choices for agility ladders include some of the most popular picks according to beginner to advanced athletes who use them. We evaluated our options based on durability, versatility, convenient portability from home to the gym, and more. 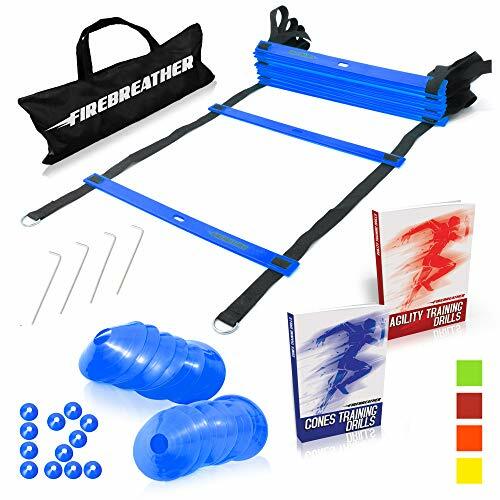 The Firebreather Agility Ladder offers excellent value for one price. 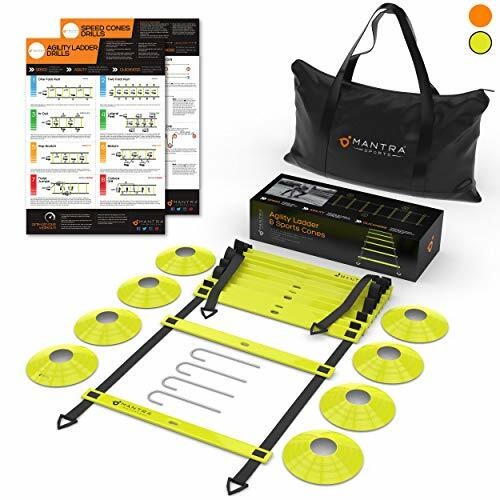 This ladder comes in a set that includes agility cones, which can further increase your movement skills during workouts, a carrying bag, an eBook with drill suggestions, and pegs to secure your ladder to the ground. The pegs also keep the ladder from twisting or causing you to trip during your workout. One of the significant benefits of this ladder is that you can adjust the 12 included rungs to define their space apart. Just slide the rungs up the nylon straps, which are 15 feet in length, to space them closer together for quick feet training, for example, or farther apart for a more comfortable workout for people with long legs or large feet. Perfect stereo headphones with high quality drivers enables you experience natural clear and super enhanced bass sound. Noise cancelling technique helps against loud and annoying noise. 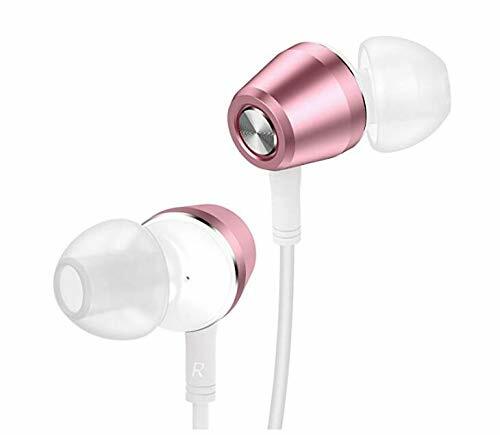 The noise isolating earphones suit ear canal naturally, and you wont feel uncomfortable, even wear for a long time also wont fatigue; they are less likely to fall out, and enjoy your music. The ProSupplier Agility Ladder also comes in a set with two carrying bags, a guide to training with your ladder, and ten agility cones to make your workouts even more intense. The ladder folds back up quickly when you’re done using it so you can store it in the bag and take it with you to and from the gym. The SkillFit Footwork Agility Ladder provides an excellent bargain for those looking for a beginner ladder for their agility workouts. With 15 feet of ladder space, you’ll have plenty of room for several different types of drills, and you can adjust the spacing of the rungs as needed. You’ll also receive four metal stakes that resist rust to keep your ladder in place as you complete drills. Your ladder stores in a convenient carrying bag for easy transporting between home and the gym. You can also benefit from the included wall poster that offers several top drills to perform with the SkillFit Footwork Agility Ladder. The Power Guidance Agility Ladder has 19 feet of ladder space with 12 rungs for you to complete a broad range of drills with. The heavy-duty rungs are constructed with thick, durable plastic, so they stay in place and stand up to wear and tear and accidental missteps. You can adjust the rungs on this ladder, but the thick nylon straps ensure that they won’t move out of place as you complete your workout. Use the included metal stakes on the four corners to keep your ladder grounded, which attach with durable D-rings. With bright yellow rungs, this ladder stands out against the ground to help you see better as you work out. 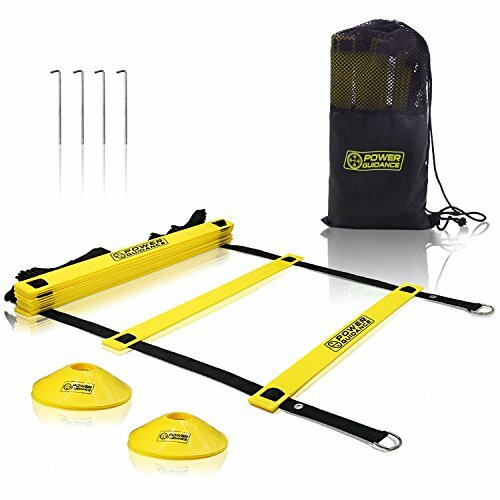 The Power Guidance Agility Ladder comes in a convenient set that includes a portable carrying case and eight agility cones, to further improve your movement, balance, and speed. 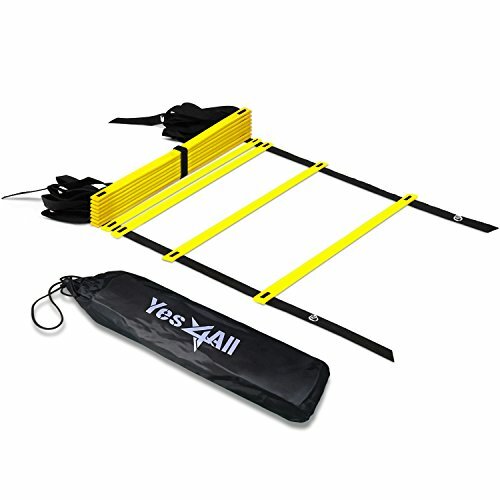 The Yes4All Speed Agility Ladder comes in a few different colors of bright rungs so you can find one that will work correctly for where you place it, such as a fluorescent yellow to contrast green grass. You can also choose between different numbers of rungs – 8, 12, and 20 – to get the perfect ladder for your needs. The largest ladder has 25 feet of space in which to house 20 rungs, which can give you the ultimate agility workout for speedy, quick-feet drills. You can adjust the rungs on each ladder up to 15 inches apart. The rungs move on heavy-duty nylon straps, which are thick enough to prevent accidental movement during your workouts. When not in use, you can roll up your ladder and store it in the included carrying case for easy portability. The ProSupplier Agility Ladder is one of the best options for beginning to advanced agility ladder users. The ladder itself is one of the longer options, offering 20 feet of ladder space with 12 adjustable rungs. This length can help you complete longer drill repetitions in each direction to improve your movement, balance, speed, and more. We also like that this budget-friendly ladder comes in a complete set that includes agility cones, a drill book, stakes, and carrying cases to give you a good deal for your dollar. When you’re done with the ladder, fold it up and store it in the case. This ladder is ideal for athletes who want to improve their agility skills, including endurance and quick movements. You’ll be able to complete a variety of drills using the ProSupplier Agility Ladder, as it stays firmly in place on the ground and you can adjust the spacing for your perfect workout.